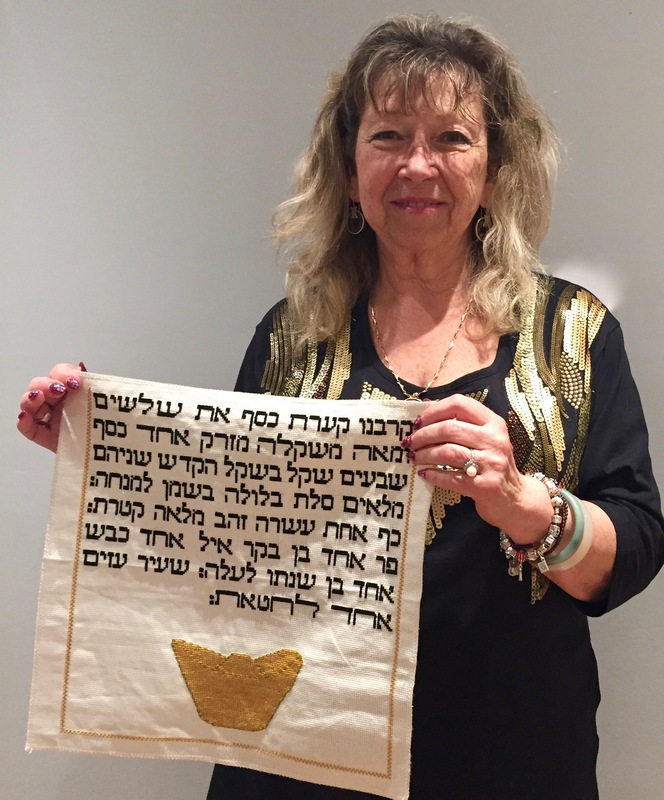 I chose to do the stitching because the connection to Judaism and wonderfully creative project appealed to me so greatly. It felt like important work and really enticed me to want to complete this. My illumination has some deep significance for me because of my connection to China through educational consulting and Chinese food cookbook writing. I chose to depict a Chinese gold yuanbao (pronounced ‘you-an bao’) which is an ancient form of gold or silver currency used until the 19th century in China because I did the stitching while I was in China and my verses refer to the retribution that was paid in many forms, with a lot of silver and gold. I am proud of this work – that my stitching can be part of a larger global community of people who did this project together. I feel blessed that I was able to be included and my heart was touched by the feelings that it evoked in me about my treasured religion. My goal for the past several months has been learning about watercolours. 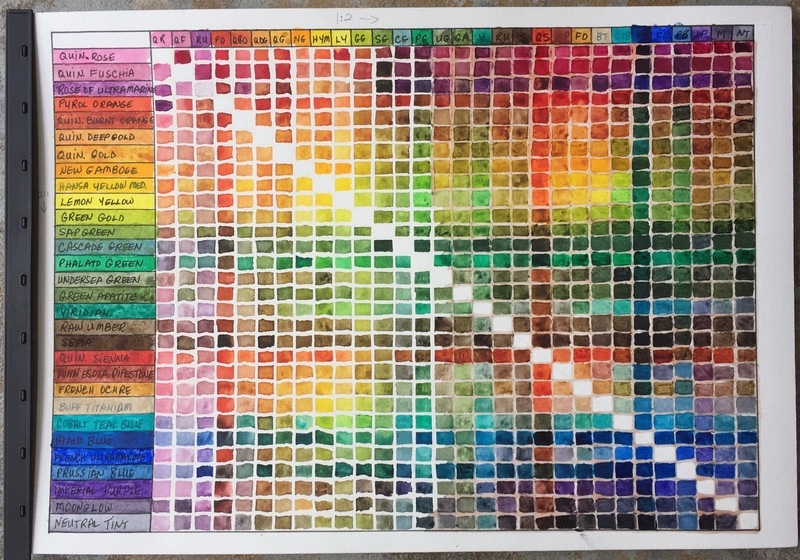 To continue achieving my goal, I completed this colour mixing chart this month to get to know my colours. It wasn’t quick – that’s because I have 30 colours. Over the summer I had a great art fix with a new bunch of Daniel Smith watercolour paint tubes. I actually didn’t know where to begin choosing colours so I called on my watercolour Facebook friends for advice. I already had 6 tubes of DS that I had used in a Craftsty online class I took about watercolours and really loved the way they painted. 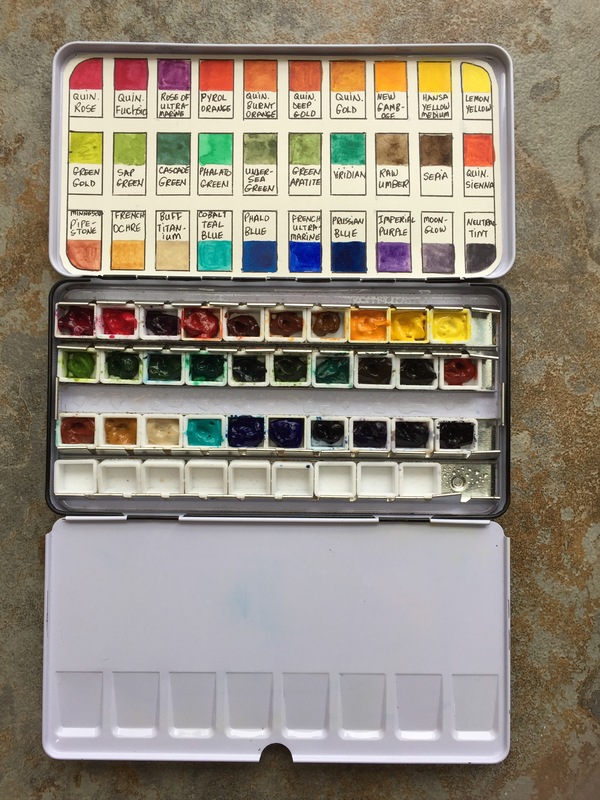 I was eager to graduate to the artist quality paints from the Winsor & Newton Cotman paint set I had received from Kelly Medford’s class in Rome last year. This set was great to start and very easy to learn to use and carry around with. But after a year of using them, it was time to move on. At the end of the discussion I had a long list of ‘must have’ colours, whittled down to 24 more. I found out that the colours you choose for your palette really depends on the type of painting you do. I haven’t stuck to one kind of painting (flowers, landscapes, still life) and am trying them all, so I just chose the colours that appeal to me the most. Since my new palette has room for more paints and moving them around, in the long run this choice is likely to change. 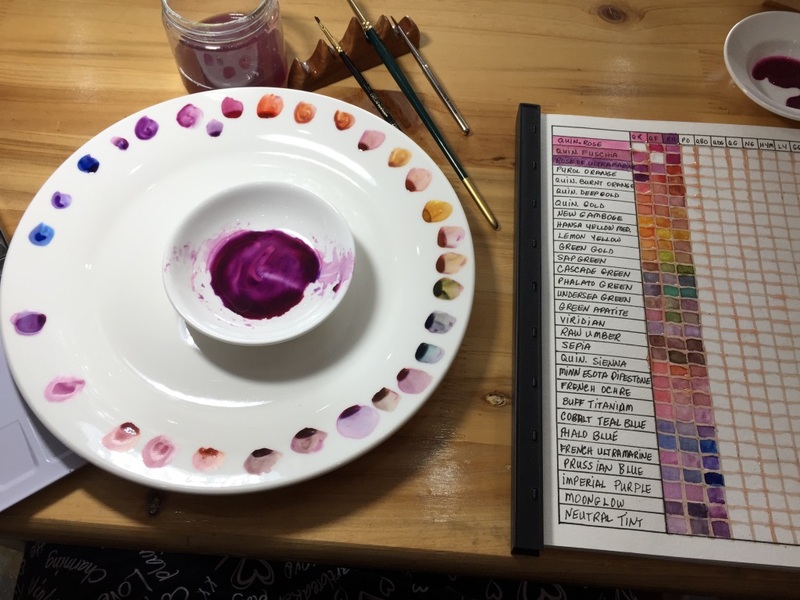 Studying how to mix paints to make attractive colours, I have found out that the 3 other paint mixing charts I’ve made have been so very helpful to use in my painting. 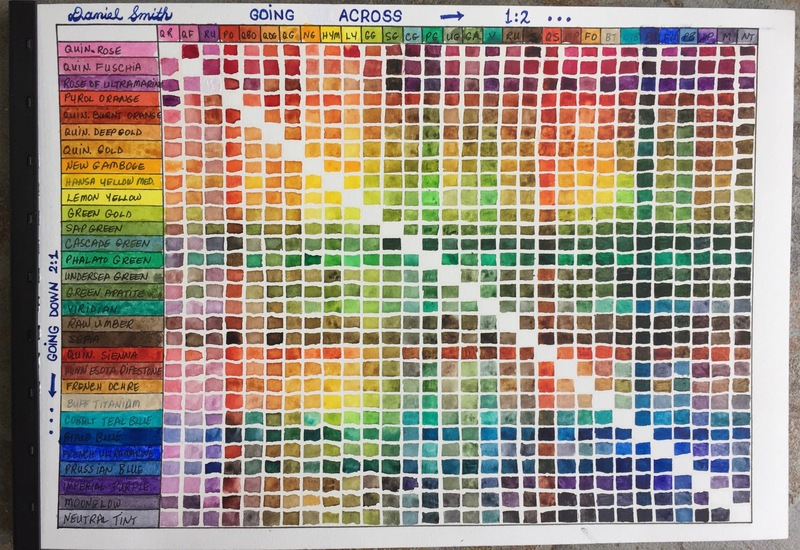 Besides being helpful, the orderly esthetic of a finished chart appeals to my senses–somewhat like a work of art in and of itself! Writing about the making a colour chart is my way of documenting it for myself for the future, and helping others to make their own colour charts! Paper towel or cloth to wipe down your dishes. I like to use a quilting ruler (but of course any ruler will do) because it’s got Metric and Imperial measurements, is see-through and has lines on the ruler, all helping with accurate measuring. I also like the Metric measures because when you have to use a calculator to divide the size of the paper by the amount of colours to get the size of the boxes that you paint in, you get an answer that’s in metric too. 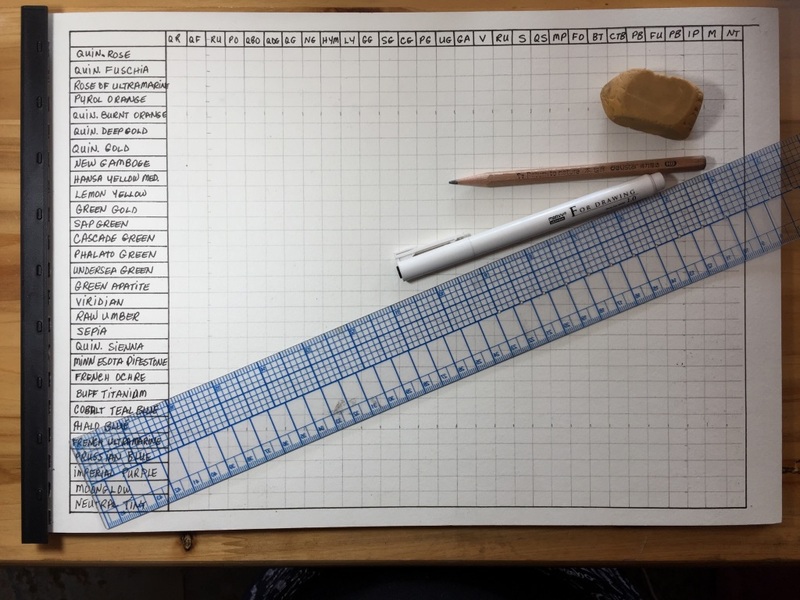 Jenny, in her blog post describes in great detail how to measure and draw out you chart, which is also the way I draw it out. Don’t forget to take your border measurement on all 4 sides into account. I also add a column to the far left and the top row to write the names of the colours. Use a sharp pencil to measure how far apart the lines will be by ticking off the lines at the left side of the page and the right side. Then repeat with the top and bottom sides of the pages. Draw the first line by matching up the two ticks at either end, and using the ruler’s edge as a gauge to keep the lines straight. 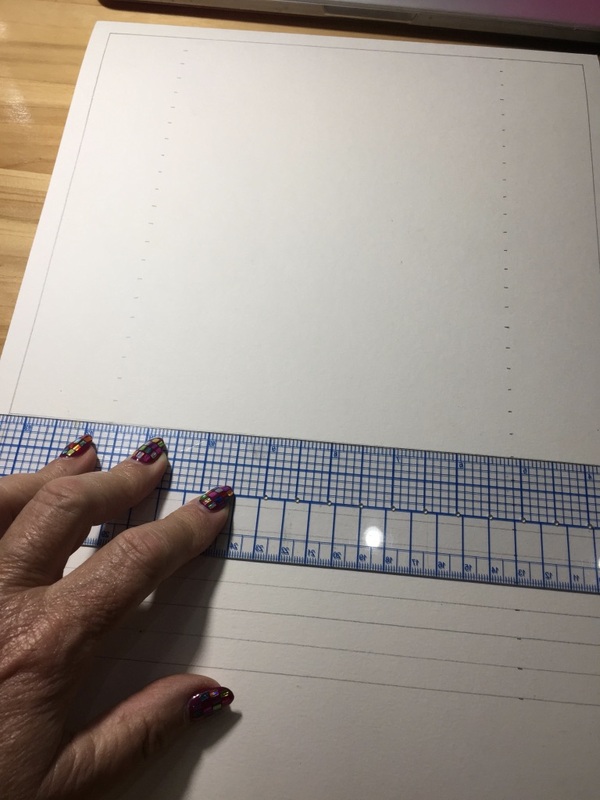 A see-through ruler is helpful to keeping the lines straight because you can match up the lines on the ruler to the edge of the paper or another line that is straight already. Write the names of the colours in the left column and at the top. Having grappled with the order of the paint colours before, the best way is to arrange your paints according to the ROYGBIV order. http://acronyms.thefreedictionary.com/ROYGBIV . Unfortunately I have a few out of order but it’s okay! On a whim, I decided that to be neat in my painting (because I knew it would be hard to paint in such small a squares without mixing the colours), I would mask out the space between each square to keep it between white. It was fast because I used it directly from the bottle but definitely not in perfect lines. Oh well, art isn’t perfect! Using a fine brush to draw the lines, I thought, would take much more time. I learned after a few lines that it was best to always keep the bottle held at a 45° angle. The angle keeps the air from flooding into the tip of the bottle and making a big blob when you put the tip to the paper. And have a paper towel or cloth nearby to wipe up the tip. As it turns out it wasn’t so crazy as I didn’t have to focus on make the boxes so neat. 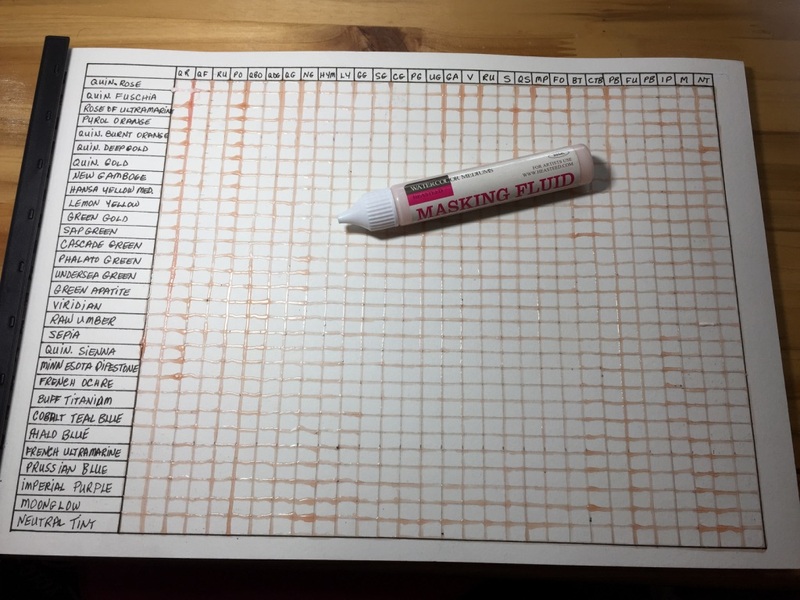 I diverge from Jenny’s instructions here to save paint and time once the chart is graphed out. 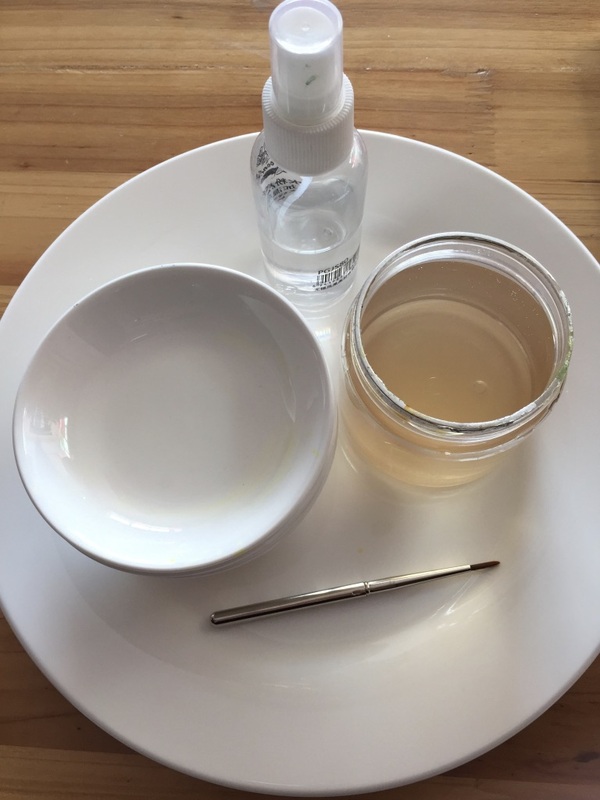 1) In a small dish start with the first colour (horizontal or vertical doesn’t matter) and mix a juicy pure colour mixture with your large brush. 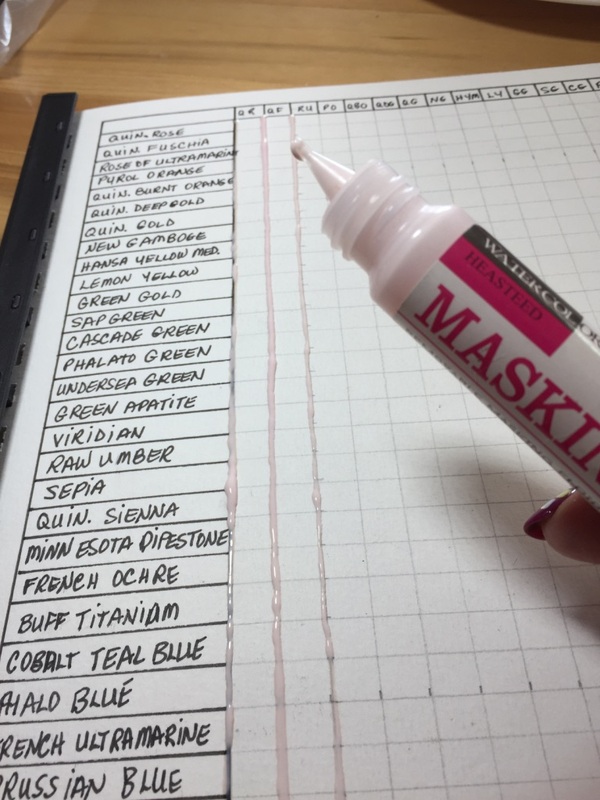 Save time by using the paint straight from your tube (if you are making your own pans). 2) Around the outside of the large dish, deposit a small drop of the colour for each of the other colours (if you have 24 colours, you need 23 drops around the outside. If you have 18 colours, you need 17 drops, if you have 12 colours, you need 11 drops. Get the idea? Then paint the colour in the box over top of the name of that colour on the left side and at the top. NOTE: if you paint the colours down the side and across the top, you don’t have to paint the mix of the same colour which makes a white diagonal line through the chart. Paint swatch of the name of the colour in the left column and across the top. 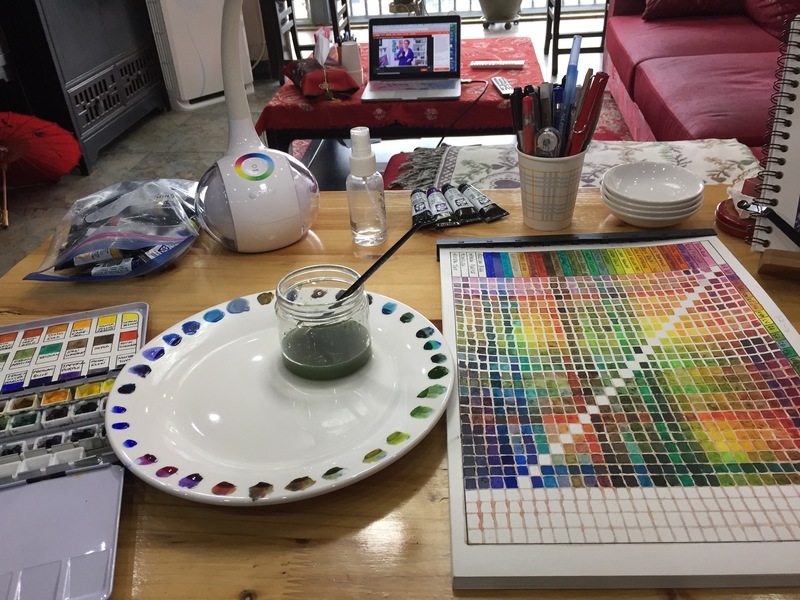 3) Dip your small brush into the second colour right in your paint palette and load it half the consistency of water to paint as the first colour. 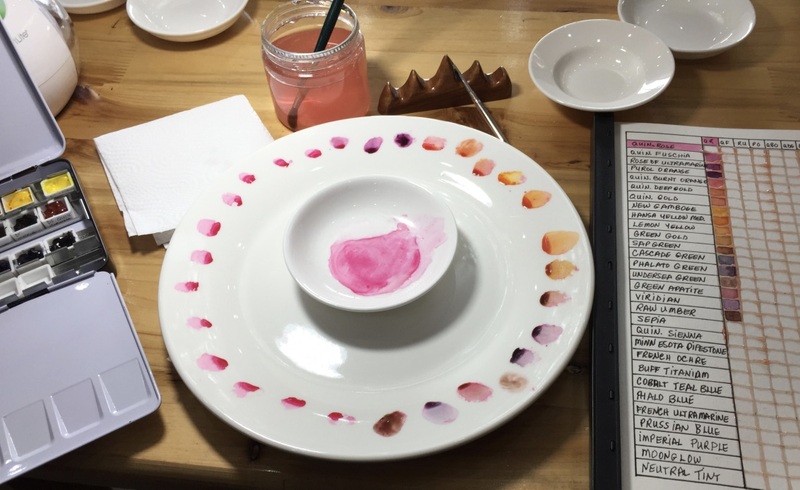 4) Add a same size drop of the second colour to one of the first colour drops on the big dish, mix together and paint in the right box on the paper. This will make a 1:2 ratio of first to second colour for every mix down the side of your paper. The swatches going down in the bottom half of your chart will have a 1:2 ratio and the swatches going across the top half of your chart will have a 2:1 ratio. NOTE: If you wish to CHANGE the ratio, change the amount of colour you put on your brush. For example if you want 1:1, use the same size drop of the second colour as the first colour. Then you only need to mix the bottom half of the chart under the diagonal. 5) Clean off the dishes and brushes. For my chart this was the most tedious part of the project. Get clean water. 6) Repeat #2, #3, #4 and #5, painting the swatch of name of the colour in the left column and at the top. Then continue until you have all the colours mixed and painted. Almost done – Check out my computer, watching a Craftsy Class projected onto my TV while I’m working. Once the whole thing’s dry, erase the pencil lines and remove the masking fluid. Note the difference mixes down the diagonal and across the diagonal. I have a whole lot of beautiful colours. Some are pure; some don’t mix well because they themselves are not pure. I got a lot of mud mixes with them. Some are great for landscapes; some are ‘bubble gum’ colours. Some are surprising like Buff Titanium, which is a beautiful colour on its own or mixed with other pigments. Neutral Tint is anything but neutral – it’s a very strong back shade if you use too much. All the purples are lovely. As are all the Quinacrodones. P.S.> Your comments are greatly appreciated.